Chief of the bet din at Slonim, Lithuania, in the beginning of the eighteenth century. 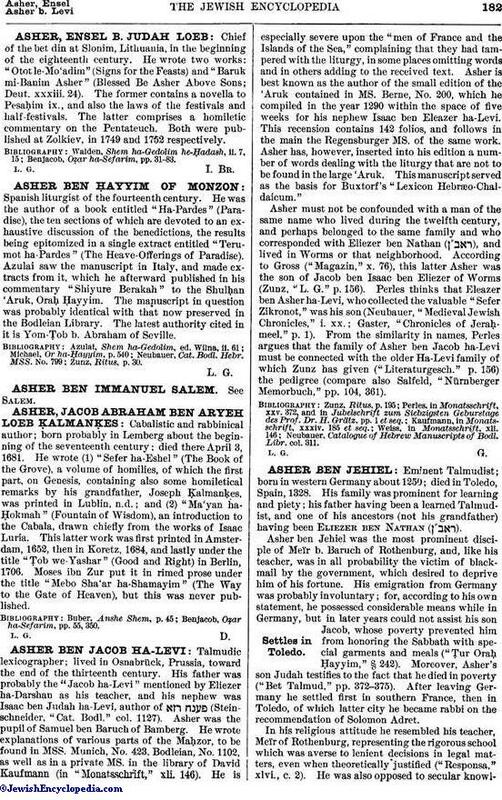 He wrote two works: "Otot le-Mo'adim" (Signs for the Feasts) and "Baruk mi-Banim Asher" (Blessed Be Asher Above Sons; Deut. xxxiii. 24). The former contains a novella to PesaḦim ix., and also the laws of the festivals and half-festivals. The latter comprises a homiletic commentary on the Pentateuch. Both were published at Zolkiev, in 1749 and 1752 respectively. Benjacob, Oẓar ha-Sefarim, pp. 31-83.